Strategy and M&A boutique that works with public and private clients on financial advisory assignments. Led initiatives to identify and approach corporate acquisition and joint-venturetargets globally, compiled competitive intelligence on core and adjacent markets, performed due diligence, modeled financial scenarios, oversaw transaction negotiations, and obtained consensus to execute transactions. Worked closely with Business Units in developing strategy and executing transactions to meet financial objectives and increase shareholder value. §Managed various divestitures and plant disposals including the sale of the discontinued, world-scale Methanol and Acetate manufacturing plant in Edmonton, Canada for $37,000,000. §Established Corporate Development web resource portal, updated acquisition financial modeling capabilities, prepared presentations for board of directors, and developed learning modules to educate internal customers and new employees. 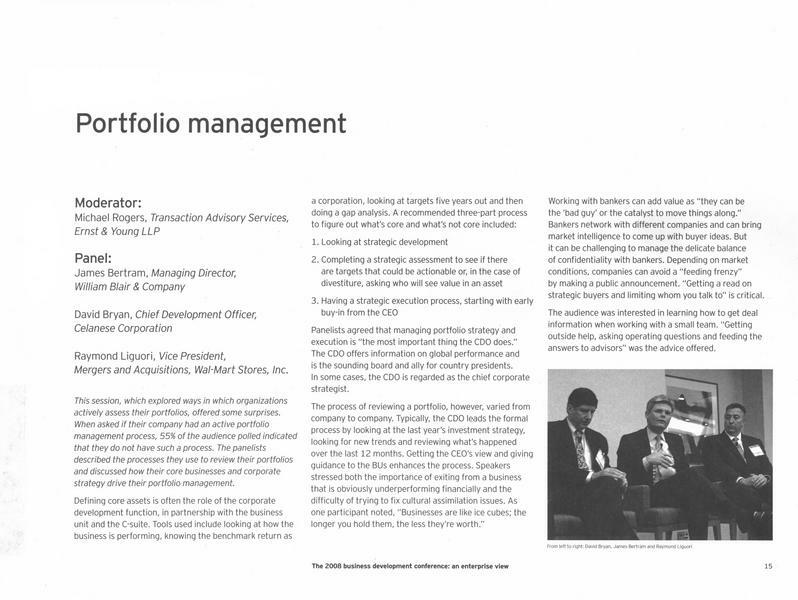 §Contributed to strategy formation, market and competitive analysis, financial modeling, and synergy estimation. §Drove due diligence initiatives, coordinated internal and external deal resources, closed transactions, and contributed to post-deal integration activities. §Negotiated new agreements with Chinese joint-venture partner for Acetate business unit. §Negotiated with multiple Chinese supply companies and government officials to set up manufacturing joint venture, producing methanol and additional raw materials to lower the Acetyl business unit’s input costs. §Engaged in divestiture of PVOH business unit to Sekisui for approximately $200,000,000. Wholly-owned advisory boutique that worked closely with numerous clients in financial consulting assignments. §Represented Indian family conglomerate to raise $5,000,000 of subordinated debt for portfolio subsidiary. §Divested non-core subsidiary for private automotive OEM supplier. §Advised private wholesale hardware company to approach and negotiate purchase of target companies. §Consulted with US public company in setting up Chinese holding company in Shanghai. Joined as Change Agent, contributing outsider's point of view to corporate and new business development activities globally with eye towards looking outside the box.Worked closely with three Business Units in strategy development, identifying potential targets, and execution of desirable transactions exceeding Corporate guidelines. §Researched new business-to-business (B2B) markets to capitalize on core competencies and analyzed complementary markets for investment, providing value-added services based on usage of B2B data. §Oversaw preparation of market analysis and made recommendations for entering e-learning, tech-based learning, educational testing, corporate training, and tax/legal markets for Education business unit. §Assisted in the acquisition of K-12 Children’s Publishing business from Tribune Education for $650,000,000. §Prepared analysis and made recommendations for entering financial content/analysis, consumer/business credit reporting, credit scoring/analytics, and business risk markets for Standard & Poor’s business unit. §Assisted in the acquisition of PriceWaterhouseCooper’s Valuation Consulting business for $110,000,000. §Assisted in the divestiture of DRI, an econometric consulting business to WEFA for $25,000,000. §Reviewed numerous options for shareholder wealth creation regarding Business Week and ABC affiliate TV stations for the Information & Media Services business unit. §Made recommendations on upgrading company’s digital rights and content management technologies. Coordinated business development, joint venture, and planning activities within Asia/Pacific region.Represented operational interests in pursuing new business opportunities primarily in Japan, Korea, and China. Served on board of numerous Asian joint-venture companies. §Negotiated purchase of fine chemical facility in Japan for etchants for manufacturing circuit boards/semiconductors. 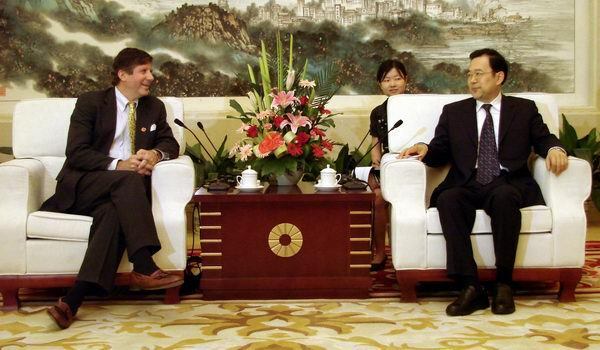 §Negotiated use of company’s amorphous metals technology with Chinese government officials. §Negotiated with consortium of three Korean firms to manufacture and market polyester fibers in Asia using company’s technology and production processes. §Performed due diligence on $12,000,000,000 Honeywell transaction in Singapore, Hong Kong, and Japan and assisted in the development of the Business Integration plan. Responsible for corporate planning and development activities for various business units, including: $900,000,000 Fram/Autolite automotive group, $2,100,000,000 aerospace equipment systems, $800,000,000 turbocharging systems, $1,000,000,000 Bendix automotive group, and $500,000,000 truck brake systems. Served as primary contact between business units and corporate regarding strategy formation/execution of transactions, achieving corporate financial guidelines and communicating with senior vice president of planning and development.Identified and promoted new business opportunities outside of existing core business units to senior leadership team. §Coordinated strategy for portfolio of engineered products with proprietary formulations, including specialty chemicals, amorphous metals, optics, avionics, and patented transportation components & systems. §Partnered in the sale of European laminates business to Cookson PLC. §Sold company’s night vision and proprietary optic technology division to Thomson, PLC. §Contributed to $675,000,000 purchase of Specialty Materials business of Johnson Matthey PLC. Responsible for financial reporting, tax, treasury, IT, planning, and supply chain activities for Owens CorningAsia/Pacific region. Worked closely with A/P President in overseeing operating activities.Led development and implementation of business strategy for Asia/Pacific region, including acquisitions, joint ventures, licensee/affiliate relations, and investment in Greenfield operations.Served on boards of numerous Asian joint-venture companies. §Established $35,000,000 holding company in Shanghai to fund future Chinese investments. §Entered into agreement with Indian joint-venture partner, Mahindra & Mahindra, arranging $75,000,000 in debt financing with Export/Import bank and Citibank to build $100,000,000 composite facility near Mumbai. §Oversaw SAP R3 software implementation for 12 locations throughout Asia/Pacific region. §Established three Greenfield manufacturing plants and ten sales offices throughout China. §Opened business offices in Tokyo, Singapore, Seoul, and Bangalore. Served as head of acquisitions and divestitures.Developed global corporate strategy with board of directors and executive management.Worked closely with business unit leaders in developing portfolio mix strategies as well as initiating and executing transactions to achieve corporate objectives.Built Corporate Development initiative from ground up, formed “Go Team” consisting of division presidents and business development leaders to generate strategy, identify targets, and execute transactions on coordinated basis. §Led the efforts to purchase eight companies and divest four divisions in first 2 ½; years with the Company. §Added core product line acquisitions to business portfolio using existing customer base, branding, and distribution platforms. §Completed joint venture with Alpha Industries, combining five polyester resin plants, sold two years later for over $100,000,000 gain. §Entered into a technology license agreement with Asahi Chemical for phenolic insulating foam. §Negotiated private-labeling agreements, adding Amoco house wrap and Amerimark vinyl siding to company’s building materials business portfolio. §Acquired UC Industries, a manufacturer of XPS insulating foam from Cortec Group for $37,000,000. §Purchased Western Fiberglass, private manufacturer of glasswool insulation for $35,000,000. §Acquired AFI, a South African manufacturer of glass fibers and composites. §Divested fiberglass underground storage tank division to Fluid Containment for $21,000,000. §Sold glass tire cord division to Nippon Electric for $5,000,000. Senior Vice President, Mergers & Acquisitions: 1992-1993. First Vice President, Mergers & Acquisitions: 1990-1992. Vice President, Corporate Finance: 1987-1990. Closed over 40 transactions while at the Company including divestitures for both public and private companies, acquisitions for buy-side clients, valuations and general advisory work, and private placements of equity, convertibles, subordinated and senior debt to finance various transactions. Maintained files on hundreds of buyout groups, investment firms and business brokers. Financial Analyst: 1985-1987. Responsible for assisting in search, initiation, investigation, analysis and due diligence of acquisitions at Masco Industries. Other business development and strategic planning activities included: analyzed capital structure and various financing alternatives for corporate growth, performed business reviews of existing operating entities, prepared offering memoranda for divestitures, assisted in the filing of several SEC and FTC documents, and prepared five-year financial business plans based upon divisional reviews and forecasts. Summer Intern: 1984 (summer of Graduate School). Assisted management with the spin-off of Masco Industries from Masco Corporation and with the preparation of SEC Form-10. Prepared the first financial consolidation reporting for both Companies subsequent to the spin-off for the Second Quarter of 1984. Senior Internal Auditor: 1982-1983. Responsible for scheduling and conducting financial and operational audits at various Company operating locations, for generating management operational recommendations, and for supervising audit staff. Assisted in the compilation of SEC Forms 10-Q and 10-K, in the filing of debt covenants with major lending institutions, and in the preparation of the year-end Annual Report to Shareholders. Staff Accountant: 1980-1982. Prepared various financial reports and performed special projects for management in the areas of taxation, inventory costing and investor relations. Graduated with “Distinction” (top ten percent of the Class). A logical, results-oriented Finance, Strategy and Development Executive with over 20 years of Multinational Fortune 500 and Investment Banking experience. Have participated in the closing of over 75 acquisition, divestiture, joint-venture and licensing transactions worldwide; as well as spent 4 years as an expatriate working in the Asia/Pacific region. Broad industry experience including: chemicals, glass, plastics, metalworking, media, building materials, automotive, aerospace and consulting.